Updated 6:45 p.m. | A painting by a constituent of Missouri Democratic Rep. William Lacy Clay has been removed from the walls of the Cannon tunnel by Republicans three times — and replaced after each incident. “We might just have to kick somebody’s a-- and stop them,” Congressional Black Caucus Chairman Cedric L. Richmond said, when asked if the painting needed security personnel to protect it. The artwork, entitled “Untitled #1,” depicts police-community relations in Ferguson, Missouri, and is from the Capitol’s annual high school art competition. Republicans have taken offense to the painting’s depictions of police officers and others as animals. Most recently on Tuesday, GOP Reps. Brian Babin of Texas and Dana Rohrabacher of California removed the artwork from the wall. Earlier in the day, Colorado GOP Rep. Doug Lamborn took down the painting after Clay and Democratic colleagues held a news conference to announce that they were returning it to join a display of about 400 paintings from the contest. California Republican Rep. Duncan Hunter took the painting down last Friday and delivered it to Clay’s office. Richmond demurred when asked by Roll Call about his next course of action after the painting was removed a third time. “We have important things like Jeff Sessions’ confirmation and we’re not going to get distracted. But the whole Republican Party versus some little kid? That’s probably not a fair fight,” the CBC chairman said, referring to the painter, a former St. Louis, Missouri, high school student. Lamborn said in a statement he thought removing the artwork was the appropriate thing to do. “I could not, in good conscience, continue to walk by a painting that so flagrantly disrespected the brave police officers that protect us here in the Capitol and in our communities across the country," the Colorado Republican said. “I decided to continue the protest started by my colleague Congressman Hunter and I hope that permanent action is taken to remove this brazen attack on the brave men and women who make up the Thin Blue Line,” he said. On Tuesday, Clay defended himself and the artist of the controversial painting as he first returned it to the display. “I do not agree or disagree with the painting, but I will fight to protect this young man’s right to express himself,” he said, standing in front of the painting. Clay later told Roll Call that Lamborn said the piece of art “doesn’t belong here” when he brought it to his office on Tuesday. Clay hung the painting back up for the second time with a staffer on the way to House votes in the afternoon. 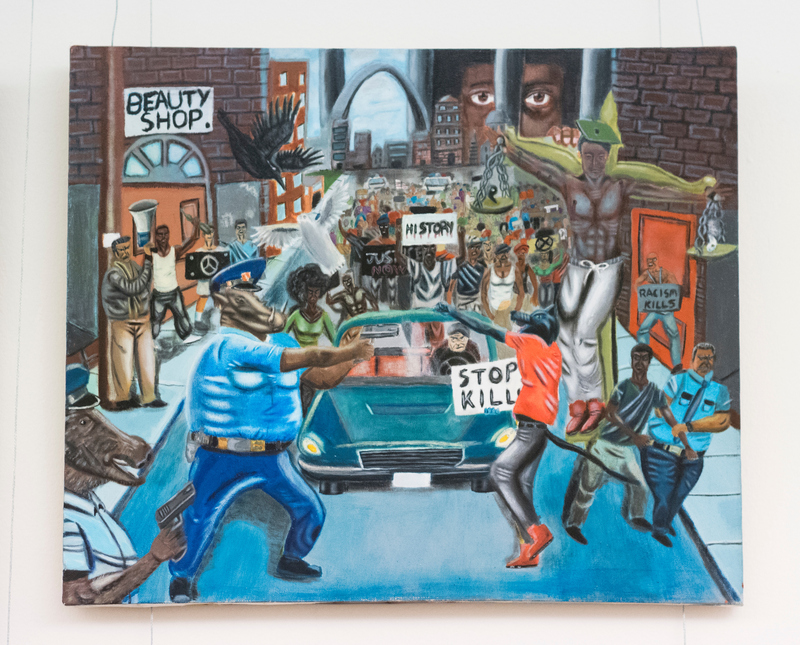 The painting by artist David Pulphus has generated controversy since late last month when police groups objected to its display in the Capitol. But the congressman also said he could understand why Pulphus feels the way he does. Ferguson was engulfed in rioting in the days after Michael Brown, an unarmed black man, was fatally shot by a white police officer. “When you think about how this young man formed his impression of law enforcement over the last five years, at the age of 13, he witnessed Trayvon Martin’s death. Fast forward two years to Michael Brown,” Clay said. “Mr. [Darren] Wilson’s behavior was animalistic," he said, referring to the Ferguson police officer who shot Brown. Pulphus submitted the painting while a student at St. Louis’ Cardinal Ritter College Prep High School, located in Clay’s district. He is now attending college. Before Hunter removed the painting, it had been hanging in the Capitol for months and was supposed to remain until this summer. The painting had just been discussed during a meeting of House Republicans before Hunter took it down last week. He also said that Washington Republican Rep. Dave Reichert, a former sheriff, is going to ask the Architect of the Capitol to remove the painting and that he plans on exploring “formal mechanisms” to have it removed. On Monday night, Clay said he asked Capitol Police to file a complaint against Hunter for theft of the painting but the police were unsure how to proceed. But he added that if Hunter would apologize, that would be enough. Richmond accused Hunter of taking the painting down to distract from an Office of Congressional Ethics review he currently faces over questions on his spending from campaign funds. 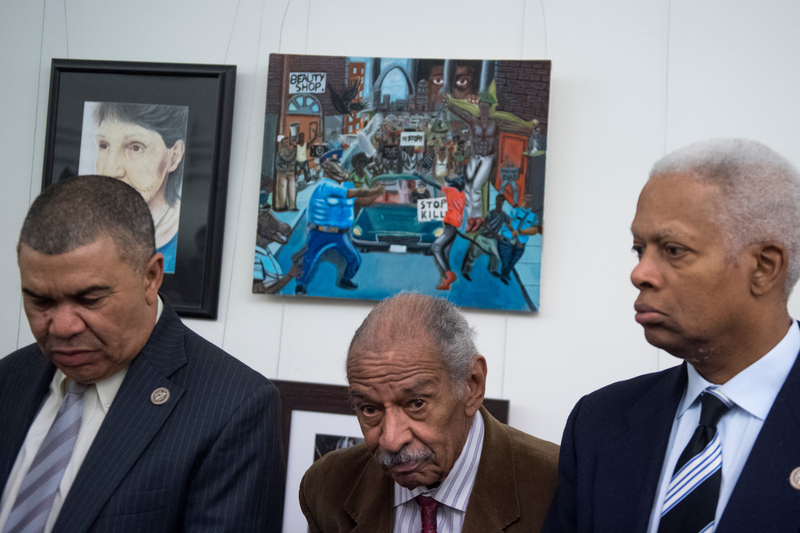 Georgia Democratic Rep. Hank Johnson called Hunter’s removal of the painting “anti-American” and pointed to the California Republican being a supporter of President-elect Donald Trump. “Now we have a president who routinely tries to muzzle the press or have the press conform to what he wants them to say,” Johnson said. Last week, Hunter told Politico he wasn’t concerned about repercussions.